Boulder City Parks and Recreation Men’s softball league wrapped up the final week of play and two seeded spots came down to tiebreakers. Time to Mash and Pit Stop took care of business winning doubleheader sweeps over the Credit Union and Boulder Tree in last week’s play. Duetto also did its part sweeping a doubleheader from Papillon gaining a tying record. The first game ended with a dramatic inside the park walk off home run by Garrett Calloway for a 14-13 victory before Duetto prevailed in the nightcap 21-16, said Steve Corry, recreation coordinator. Despite the heroics, Papillon gained the third seed in this week’s tournament via a tiebreaker. Tournament play Tuesday and concludes at 6 tonight at the ball fields at Hemenway Park. Time to Mash, 17-3; Pit Stop, 17-3; Papillon, 10-10; Duetto, 10-10; Credit Union, 6-14; Boulder Tree, 2-18. 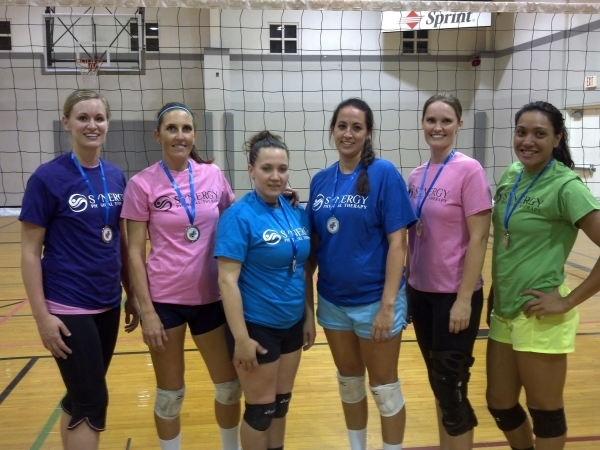 The fall women’s volleyball league offered by the Boulder City Parks and Recreation Department concluded Nov. 9 with four teams vying for the top spot. The Amazons, Heavy Hitters, Volleygirls and Synergy Therapy played close matches throughout the night. The Volleygirls and Synergy met in the winner’s bracket preliminary round and regular season champ Synergy was pushed to a three-game match for only the second time in the season before prevailing 25-17, 19-25 and 15-9. The Volleygirls weren’t done and advanced through the loser’s bracket including 25-14 and 25-20 wins over the Heavy Hitters. Synergy outlasted the Volleygirls in the tournament final, squeaking out the second game with an extended 26-24 win, according to Steve Corry, recreation coordinator. The Parks and Recreation Department sponsors women’s volleyball in the fall and spring with the next league beginning in March. Contact the department at 702-293-9256 for more information.